Let 904 Custom help you with your best man & groomsmen gifts for your wedding with this 32 oz 04 64 oz. Amber Growler featuring their name, their prestigious position & a manly mustache. Looking for a unique gift for your buddies and their dedication to your wedding day? 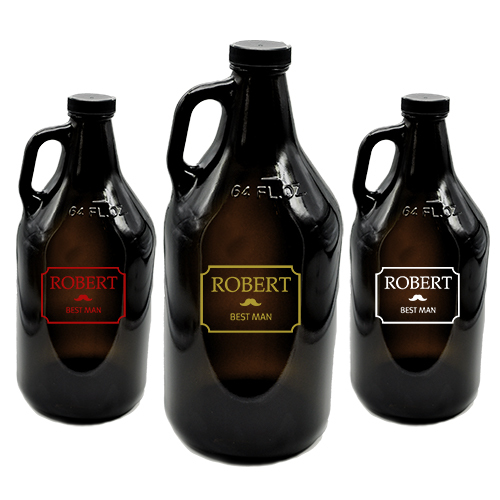 This 32 ounce/1 liter or 64 ounce/2 liter amber growler is the answer to your appreciation woes. 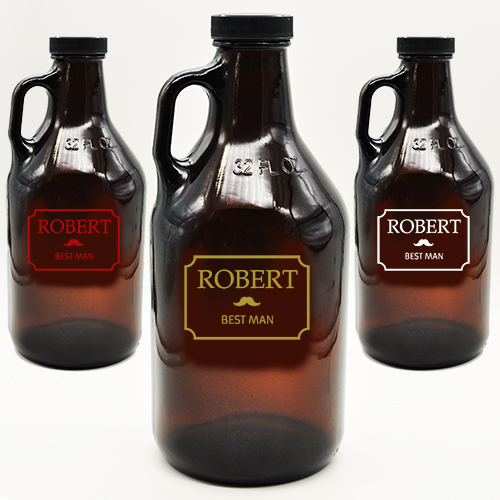 Featuring a manly mustache, personalized this growler with your best man & groomsmen's names & their position in the wedding. Fill it with your hand-crafted beer for that extra special gift. Design is sand blasted into the glass in your choice of natural etched, red, white or gold color fill. Screw top lid is included. Hand wash only! Order for the whole wedding party today!